Your first objective in Anguna is to escape from the starting dungeon. After that, you will want to explore the world, find and defeat the leader of the monsters, and return home. 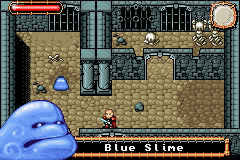 The first difficult battle of the game will be with the Green Toady, 3 rooms south of where you started. As with many of the battle in this game, you will die quickly if you just attack without thinking. Instead, watch and dodge until you understand the pattern of the enemy. Then, he should be fairly simple. A life potion will be your reward for defeating him. These are fairly rare, so don't use it too hastily! The boss of the first dungeon, the FireCroc, is quite difficult if you haven't found some of the items that are hidden in the dungeon. This is hidden somewhere in the northeast portion of the dungeon. It should be fairly easy to find. The attack powerup is well-hidden. Use the in-game map for clues of where to look, and try walking through a wall. Once you have these items, the FireCroc shouldn't be too difficult. Learn the timing of his attacks, and how to avoid them. 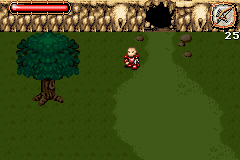 Then either shoot arrows at his head, or move in for an attack, then run back to avoid the fireballs. After escaping from the first dungeon, the real game has begun. You will need to find 3 more yellow keys, and then enter the final dungeon to defeat the leader of the monsters and return home. If you have trouble figuring out where to go next, check out the shop south of the first dungeon, and purchase the map that will help.